Hong Kong is paradise for those with refined taste buds on a tight budget. Unlike other expensive cities, such as Tel Aviv or Helsinki, it is possible to eat like a champion without spending a fortune in Hong Kong. 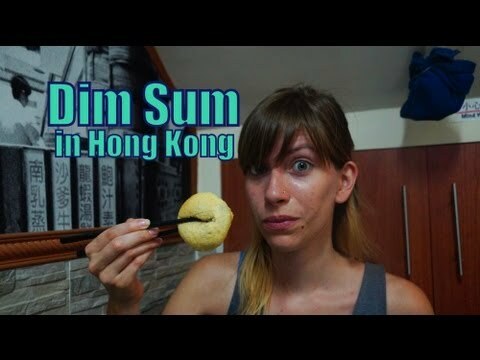 Through the recommendation of a friend we visited Dim Sum Square to sample some of our favorite bite sized snacks along with a cup of a Chinese Pu’er tea. It turns out our insider tip from our friend proved to be valuable as Dim Sum Square was a notch above the typical dim sum places we’ve frequented in the past. The standout dish was the crispy barbecue pork pork bun. With a layer of baked glazed sugar it was so sweet and rich in flavor that is could have been a decadent dessert. With a few more days left to explore the city, we’ll definitely make the time to return to this family run dim sum restaurant. Dim Sum Square! We’ve been walking for what feels like at least an hour to find this place. We actually ate over here yesterday when we took a food tour of the city and it was amazing. So Sam wanted to find it again. And we didn’t have any map or any directions with us, so we have to kind of place it by memory. And we did a good job. Yes, we’re here. Let’s go eat. So this place has a pretty cool menu. They just give you a slip of paper and you check off which food items you’d like to have. Fortunately, this one also has English writing, so it makes our job much easier. Let’s see. So if you’ve been following along with our food videos for a while you’ll probably remember we had Dim Sum several times in Malaysia. It was excellent but this is where Dim Sum originated from. From Hong Kong. And it’s just a notch better. So in many of the other dim sum restaurants we’ve been to especially in Malaysia they come around to your table with push carts and you’re able to select what kind of Dim Sum you’d like to eat. But because we’re here in Hong Kong and space is so limited you have to order from a menu and they just bring it to your table. There is no way they can push a little cart around in this small confined space. So Dim Sum literally means small bite and if you were to invite someone out for dim sum you would actually invite them out for tea. So this is my favorite one. The shrimp dumpling. Even though I normally don’t like seafood. I don’t like shrimp. It’s okay when it is in dumpling form. I’m going to dip it there. This is really hot. Still steamy. Nice and plump. So this here is a new one we’re trying. I’ve never had this before. It’s a deep fried glutinous rice ball with pork stuffing inside. So I can already tell it’s crispy. That is sooo sooo good! It’s almost a bit like a mini meat pie but it’s got that stickiness of the glutinous rice inside. Oh, it’s so good. So this is another favorite of ours. It’s called the crispy barbecue pork bun. And what Iike about it is almost sugar coated. It’s really sweet on the outside and the barbecue sauce inside is also quite sweet. So it feels like a dessert even though it is meat. Mmmmmm. It’s nice and fluffy like a pastry. Like a French pastry. Oh, yeah. Mango pudding for dessert. It’s not homemade. I was expecting a little homemade bowl but its nice. So this wonderful dim sum feast which consisted of four different dishes and tea only came to seventy two Hong Kong dollars which was a steal. Basically that’s less than ten US dollars to feed both of us. These videos always make me hungry! The food looks delicious. Thanks for sharing. Yum! About to have dinner and wishing I had gone with Dim Sum rather than pizza. Will have to keep this one in the memory bank for when I visit.